Not using Social Media to promote your business? Using Social Media but don’t have a proper strategy? Like to learn how to write for Social Media to have maximum impact? 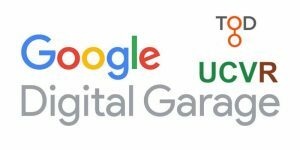 By popular demand, Todconnect in partnership with UCVR* are bringing Upskill Digital Google experts back to the Calder Valley, so join us in Todmorden on 4th April where our Google partners will be presenting some of the digital ways to get noticed online. We are giving priority to businesses in towns in the Calder Valley affected by the ongoing economic impact of the 2015 floods. All business in the valley are welcome to attend but you must pre book here. If you are outside the valley, then please email us to tell us why you would like to attend. Please don’t book because it is free and then not attend, you will be wasting an opportunity for others and causing food waste too. Do you find the options confusing for advertising and marketing online? Sometimes feel overwhelmed by the digital internet world, yet wishing you could understand more about how to attract new customers? If you’d like to learn new digital skills for your business, then Mytholmroyd Business Group in partnership with UCVR* are bringing Upskill DigitalGoogle experts to the Calder Valley, then join us in Mytholmroyd on 13th February, where our Google partners will be presenting some of the innovative ways to get noticed online. We are giving priority to businesses in towns in the Calder Valley that we are supporting, affected by the ongoing economic impact of the 2015 floods. All business in the valley are welcome to attend but you must pre book here. If you are outside the valley, then please email us to tell us why you would like to attend. Please don’t book because it is free and then not attend you will be wasting an opportunity for others and causing food waste too. There are limited places so book your ticket now! Following the recent informative survey results from Todmorden and Sowerby Bridge, we have now concluded a business survey of Elland. Whilst there are some common themes emerging each town is unique with varying business sectors, Elland is no exception. The survey was open from late February to mid-March, 2018 and was tailored to the local business sectors. Business Support (41%) and Joint Promotions & Events (41%) were also popular. The former with the Manufacturing group of sectors in the surrounds of Elland, and the latter with Retail/Town Centre businesses. Comments suggested that respondents felt that networks and associations could benefit Elland by increasing footfall in the town centre and by building identity and promoting the town. This might be achieved in part by bringing different types of businesses together and encouraging trade and spend within the local area. Specific issues for the town centre were mentioned, particularly the lack of banks and parking, the type and quality of businesses and restricted Saturday opening. These insights will help shape the business networks events and group activities. Following the success of our pilot survey in Todmorden, in October 2017, we agreed with the Calderdale business team to repeat the survey in Sowerby Bridge, another town affected by the 2015 floods but which had no formal business group representation. The survey was trialed in early January 2018 and fully undertaken in the town in late January and early February and tailored to the local business sectors. A social media group was the top choice in particular for the hospitality sector, businesses with shopfronts/retail premises, and also businesses under 10 years old. 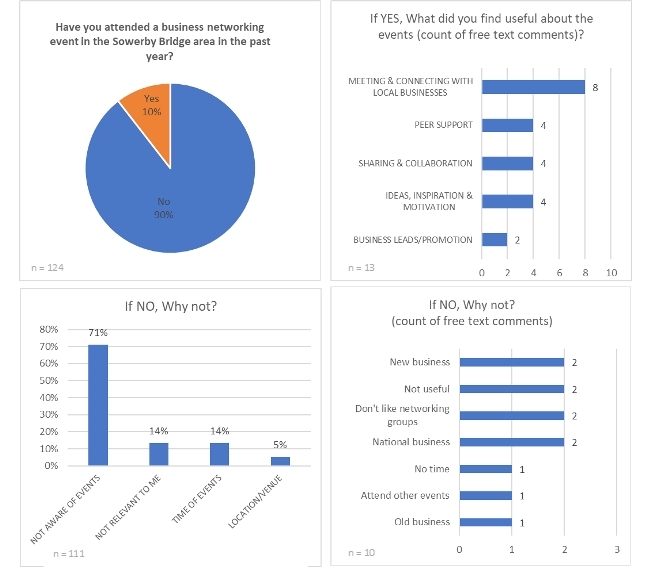 Comments suggested that respondents felt such benefits could be achieved though better awareness of and connections between local businesses who could collaborate to attract visitors and trade to the area, and also increase trade with each other. A further run of this survey will be undertaken in Elland in March. These insights will help shape the business networks events and group activities. This was particularly characteristic of town centre businesses, and the retail, arts and community sectors. The need for business support, discussion forums and updates varied across sectors and business types. A Stronger Business Community’ (52%). Previous events were valued for the opportunity to meet and connect with other similar businesses, peer support, sharing of information (e.g. other events), and specific pieces of business support. 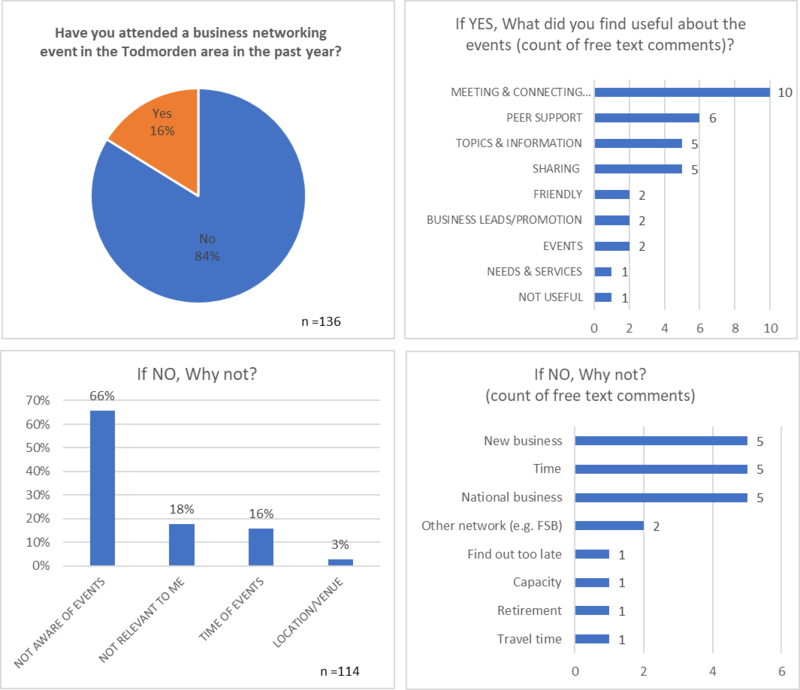 84% of respondents had not attended a networking event in the Todmorden area in the previous year. 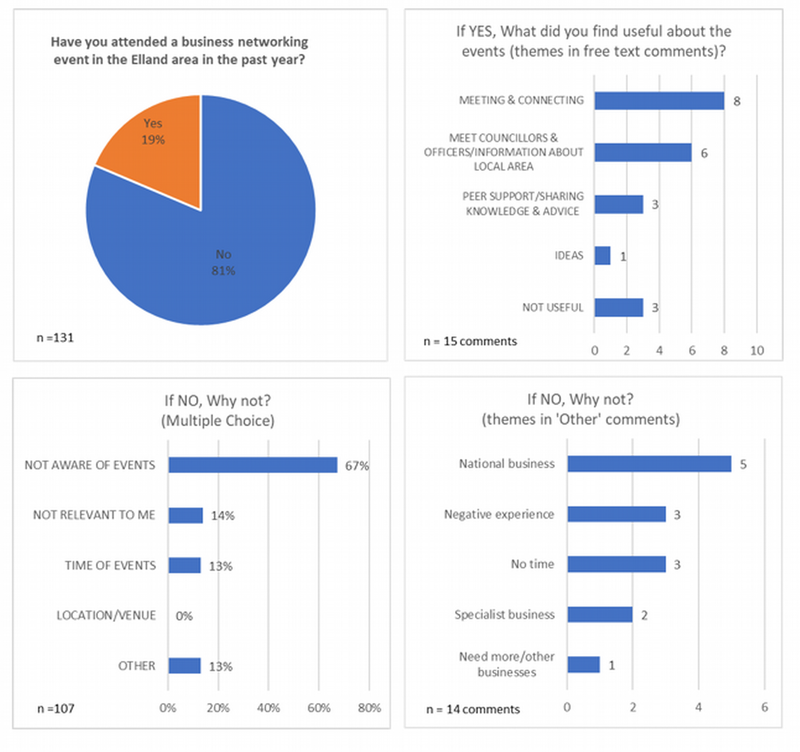 The most frequent reason given for not attending was: ‘not aware of events’ (66%). More informal events are likely to be more popular. The sense of place is important to businesses collectively, and they would be draw together for events promoting collective benefits to businesses and the town as a whole. There is a feeling that they are behind the curve with social media and peer support would help boost their confidence and use of social media promotions. This survey will be repeated in Sowerby Bridge in January and Elland in February as we continue to support the development and sustainability of business networks in the flooded towns, towards a full economic recovery. 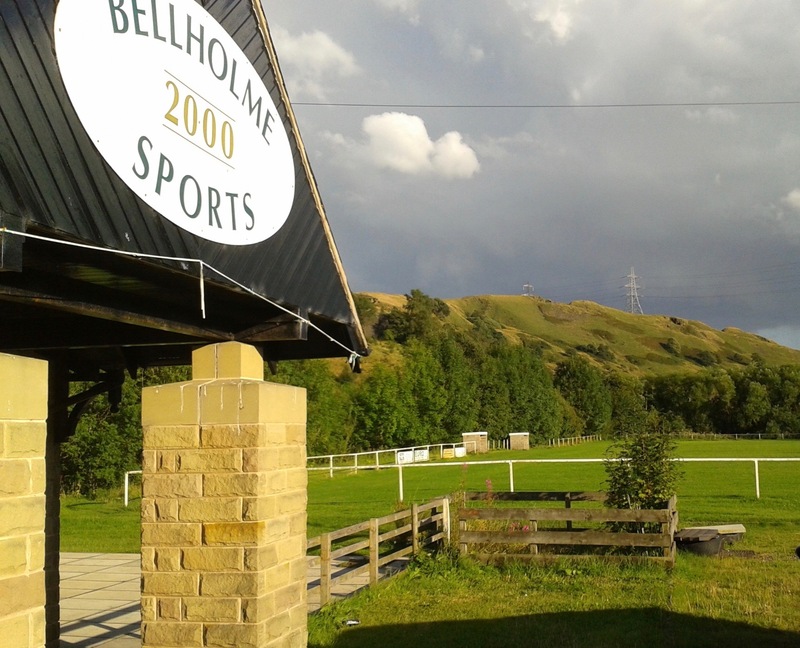 We are pleased to announce that after a two year process of unraveling a complex legal situation, the long-term future of Bellholme Sports Ground in Walsden has been secured by the ownership being transferred to the UCVR. Todmorden Civic Society (TCS) had owned the site since it was acquired in the 1980s. It was held in trust for them by a group of trustees and leased to another group of trustees for the Bellholme Sports Association (BSA). The ownership had been in legal limbo after all the members of the TCS trust had sadly passed away in recent years and the BSA had ceased to constitutionally exist. The land could potentially have been lost in a legal quagmire, possibly ending up in the hands of the treasury or even perhaps a property developer. Current TCS members did not have the capacity to manage it, or establish a new trust and so they offered it to the UCVR as a ‘safe pair of hands’ to protect it for the community and to revisit the original vision of the founders. The UCVR board are fully conscious of the efforts and tenacity of the founders of Bellholme Sports Ground who fought to secure it from construction and development in the 1980s, and also of their vision for a sporting venue of mixed use. We believe that the time is right for that vision to be revisited. We are looking to work collaboratively with the current users, Todmorden Borough FC, and with the rest of the local sporting community to enhance the use of facilities to meet as much demand as possible whilst maintaining quality pitch standards. There are both limitations on the pitch use but also many opportunities for wider use of the site. Due to the absence of direct trustee involvement, only the one club has had access to the facility for several years. The UCVR has had representations from junior teams in the area desperately needing more pitches, and has already made provisions for them to use the facilities in the coming season. Our immediate plans are to ensure that the clubs using the pitches can play out their season with confidence that there are not going to be any major changes affecting their usage. We have formed an interim management group including representation from the clubs and TCS, who we agreed would maintain an interest in the management of Bellholme. This group will work together to ensure the site is financially viable until a more sustainable business plan is devised and implemented. There is a lot of potential for the site in terms of future improved facilities, and so it is our intention to establish a sports development advisory forum drawn from local sports clubs. That way we can consult, assess realistic demand and research funding for particular sports which may be suitable for the site. Todmorden Community College – What happens now? Following the presentation last week to the Todmorden Development Board, of our Pre-feasibility study into the alternative proposals for Todmorden College, the board voted 7-2 in favour of the Aldi proposal. The Board has thus recommended to the Calderdale cabinet that they pursue the Aldi proposal. It is hard to see the Cabinet rejecting that recommendation, but it may also eventually have to go to full council, according the Director for Economy and Environment. We were disappointed for the people of Todmorden that the Board did not consider that Aldi will build a supermarket anyway on the adjacent site, and that they were more concerned with short-term savings than affording the community of Todmorden the opportunity to develop further the potentially viable proposals that we put before them in the pre-feasibility study. Aldi have to eventually get planning permission for the new proposal and so we will watch with interest to see if the people of Todmorden will accept the loss of an asset that easily. We prefer to work in collaboration with our local authorities, as we do on business flood and economic recovery. It is not our remit to be a campaigning organisation, but we stand ready to work for and to help develop opportunities for our communities to retain ownership of assets, particularly should there be a potential long-term and viable benefit to those communities. In this case we believe our study will support any group that seeks to persuade Calderdale that the Development Board were out of touch with the people who actually live in the town. Should the Aldi proposal fall, be rejected or be withdrawn, we will remain ready to work with Calderdale, Todmorden council and all interested parties towards a viable use for the site. We would encourage the interested parties to continue working up their alternative plans. As promised we delivered our pre-feasibility report to Todmorden and Calderdale Councils in the first week of 2017. The time scale for completing the report was very short for such study but we are pleased to say that our project manager did an amazing job to gather as much information from the community as was possible in the time available. The result was a 30-page report which reviews the basic proposals put forward by various groups and individuals for the continued educational use and other alternative uses. The options to be considered were firstly, to sell the college to Aldi for demolition and for them to build a bigger store. Their offer included allowing a stand-alone building to be built on the site to house a replacement children’s centre and youth facility. Secondly there were various community initiatives regarding education, new and existing curricular. And there were commercial proposals: meeting rooms, office space and visitor accommodation. Our research concluded that there was little support for a larger Aldi store and much more for some combination of a community run asset incorporating various educational and community enterprises. Our recommendations were that Calderdale Council, rather than opting for short-term savings and a relatively quick development, instead offer the community the same opportunity as they have elsewhere in the Borough, of putting together a business case for running and or owning the College. The Development Board will meet on Tuesday 10th January 2017, at 5pm to decide the future of the College. The meeting is open to the Public. You can read our full report here. 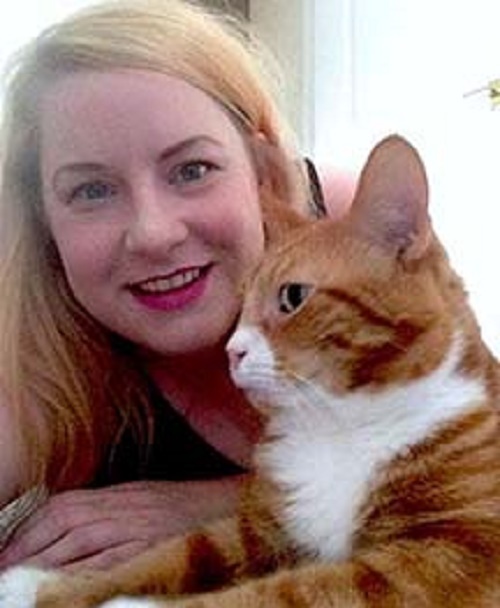 This is the story of Vanessa Guy’s cat ‘Harry’ which alerted her to the Mytholmroyd flood alarm on Boxing Day 2015. Vanessa suffers from narcolepsy and might well have slept through the alarm as her home flooded, had Harry not jumped on her! As a thank you to Harry, Vanessa has created a children’s book that tells the story of how she and her cat were affected by the floods. Some of the proceeds of Harry and the Flood will go to the Watermark flood resilience fund, set up by the Community Foundation for Calderdale. “It was a time of loss for so many people in the Calder Valley, but also lots of community spirit and people came out to help each other. “I wanted to share Harry’s story because it’s hard to explain to children why one day you’re having Christmas and the next you’re homeless. Harry has been with Vanessa since he was a kitten. When her health took a turn for the worse because she could no longer take narcolepsy drugs, Harry stayed by her side day and night. Vanessa was helped bring the book to publication by volunteer Paula Sutherland and the UCVR are pleased to provide fund hosting and the admin to support Paula’s work. 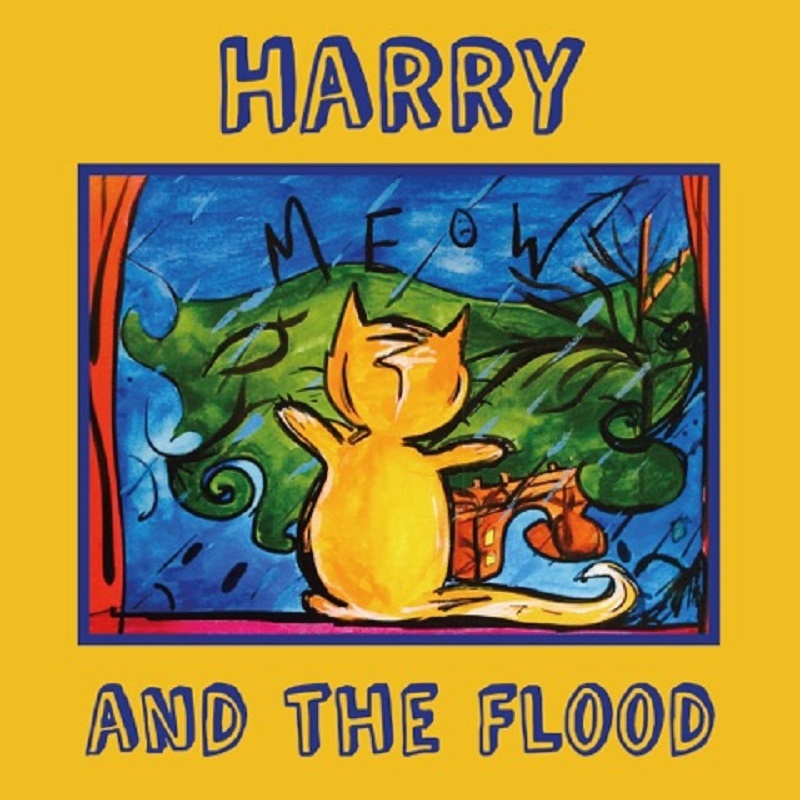 Harry and the Flood, published with funding from Community Foundation for Calderdale, will be launched at the Blue Teapot café in Mytholmroyd on Tuesday, December 20 from 6.30 to 8.30pm. Vanessa will be there to sign copies. She’ll also be at Legacy Comics, Westgate Arcade, Halifax, on Friday, December 23 at 12.30pm. Local shops, tourist information centres and Hebden Bridge Town Hall will also be stocking the book, which costs £3.99. 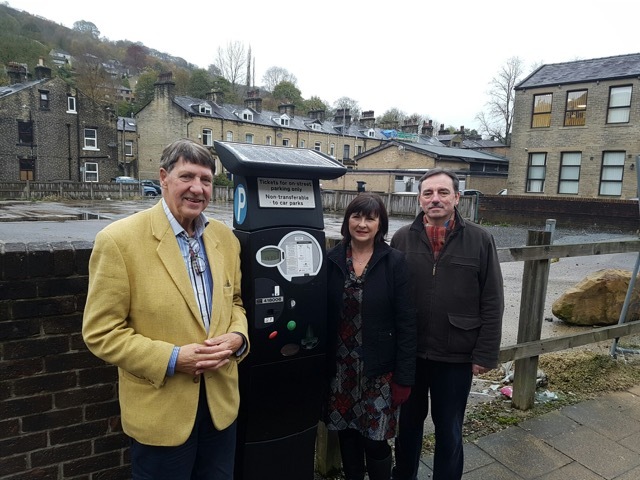 In a joint initiative with Bridge Mill owner, David Fletcher, we have secured to reopening of the former car park at the old fire station site in Hebden Bridge. We hope that this project will continue for at least six months. We will fund part of the rent from our strategic fund for business recovery following the 2015 floods. This initiative will, we hope, help the town to recover some of the economic losses of 2016 as a result of the flooding and prolonged recovery period. Stephen Curry, Chair of UCVR said “we have spent almost all our time this year on strategic support for business recovery along the valley since the floods, it seemed entirely appropriate to end the year supporting such a smart economic initiative. This will boost the trade in Hebden Bridge at just the right time. Businesses there made up 30% of the total devastated by flooding along the Calder Valley and this will help in their ongoing recovery process”. Val Cryne of the Cook & Coffee shop, and Vice Chair of the Hebden Bridge Business Forum, said “This is great news, what a fantastic early Christmas present for both the traders and shoppers. And just in time for ‘Small Business Saturday’ and Hebden’s late night shopping on 2nd December. We would like to thank both David and the UCVR for making this happen”. The car park will be opened on 24th November. David said “because this is a short-term project it can’t be run like the pay and display carpark it was, it will need to be a manned car park, so only open during the day, except for the late night shopping event. We want to encourage people to stay longer in the town, so the charges will be simple, £1 for up to two hours or £5 for all day. Those using Bridge Mill café and shopping at Innovation will get a refund of parking charges. Stephen Curry added “as a not for profit company the UCVR would be happy to cover its cost, but any share of a surplus will be used to support our work in the community. The main purpose of this initiative is that the local economy gets a real lift for the festive season and beyond”.